Always keen to find new talent, December also sees the launch of our first ever internship competition: we’re looking for two superb graduates to spend a year working with our design team in London. I-AMers have been visiting universities across the UK, spreading the agency gospel to future designers and introducing them to the competition. With excellent feedback from students and lecturers and lots of interest on social media, the competition looks set to attract plenty of strong applicants and we can’t wait to see the creativity on offer. Being a design agency, it may not come as a surprise that we are posing applicants a creative task. 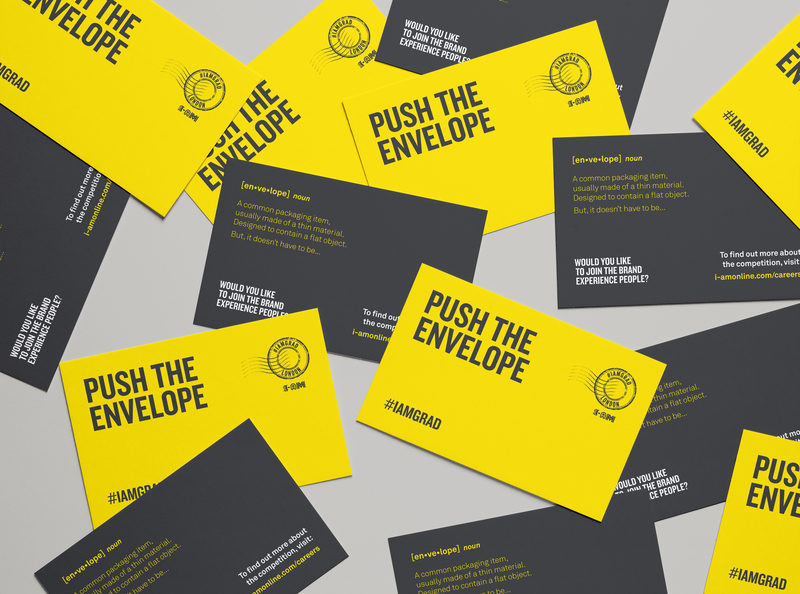 The theme is the re-invention of the humble envelope. Along with their portfolios, we’re asking graduates to send us their creative ideas for what else an envelope can do, say or be by uploading their entries to Instagram tagging ♯iamgrad. Why not have a look at the brief. How would you approach it? The graduates with the best original ideas and portfolios will be shortlisted for interviews to take place in the new year. The competition runs over Christmas, closing on the 31st January. And while you’re here, check out our film, ‘A Day in the Life’ at I-AM London.